The Neptunian (Item No. 51203/1), providing a rather inauspicious start to the line of Aliens figures. This figure is actually fairly ornate and well-designed, in a Saturday-afternoon-sci-fi-serial kind of way, but its great failure is that it NEVER APPEARED IN "STAR TREK." 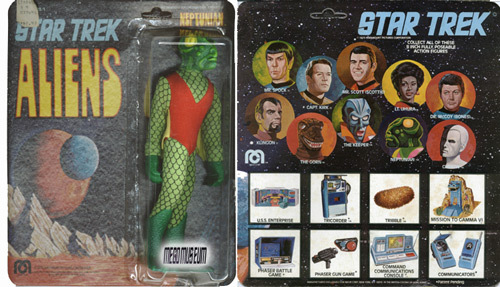 Even the relatively limited history of Classic "Trek" contains enough rich and diverse alien cultures from which to draw without having to create a new species right out of the gate. 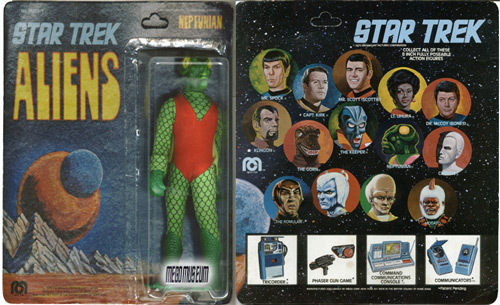 To be fair, a race of aquatic, scaled aliens DID appear in an episode of "Star Trek: The Animated Series," but their resemblance to the Neptunian is practically zero. The head sculpt is quite impressive and detailed; it is also bulbous enough to require Mego's rarely-used deeper/taller bubble in its packaging. The body of this figure is a standard Type 2 male, but is cast entirely in Goblin-green. 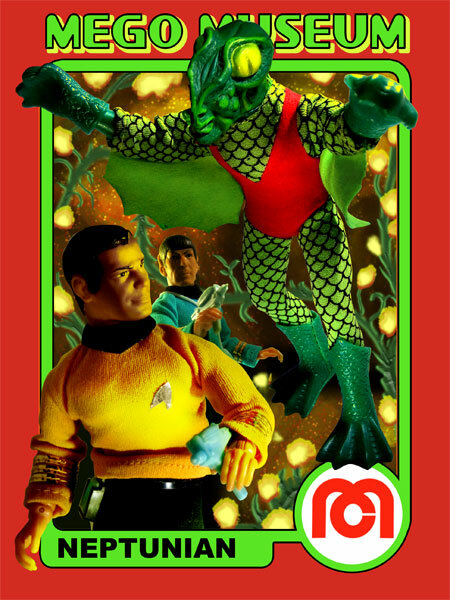 The figure came outfitted in a bodysuit comprised of a red torso and green sleeves and leggings (the green material used for the bodysuit is identical to the "scales" fabric used on the Green Goblin and on The Lizard's tail). Attached under the arms of the bodysuit are a pair of wings that always seem to suffer from the same green-to-yellow fade common to Green Arrow's bodysuit and the sleeves and undies of Removable-Mask Robin. The ensemble is completed with a pair of green boots and green gloves that approximate the look of reptilian/amphibian feet and claws, respectively. Above we have a Neptunian on a "10-back" card. The Neptunian on a "14-back" card (considerably rarer than the "10-back"). 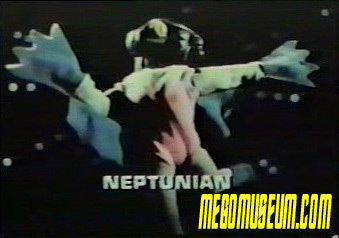 Mike Farrence provided us with a screen cap of a Mego Commercial that shows the prototype neptunian, note the lack of scales and the homemade gloves.